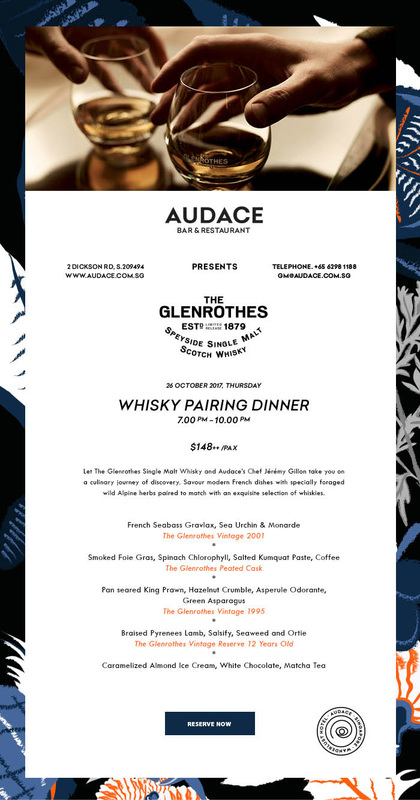 Contemporary bistro Audace Bar & Restaurant will be hosting a whisky dinner on Thursday 26 October 2017 from 7pm to 10pm featuring the Speyside whiskies of Glenrothes. This 5-course whisky pairing dinner will see Audace chef Jeremy Gillon take diners through a modern French culinary journey that’s paired with four different Glenrothes whiskies. If you’re not familiar with Glenrothes, the Speyside distillery was owned by London wine merchants Berry Bros & Rudd when they got it in return for selling the Cutty Sark blended whisky brand to Edrington Group; earlier this year Edrington Group – owners of The Macallan and Highland Park – purchased Glenrothes back from Berry Bros in order to grow the brand in international markets. This whisky dinner costs $148++ per person. You can book a spot by calling 6298 1188 or emailing gm@audace.com.sg.